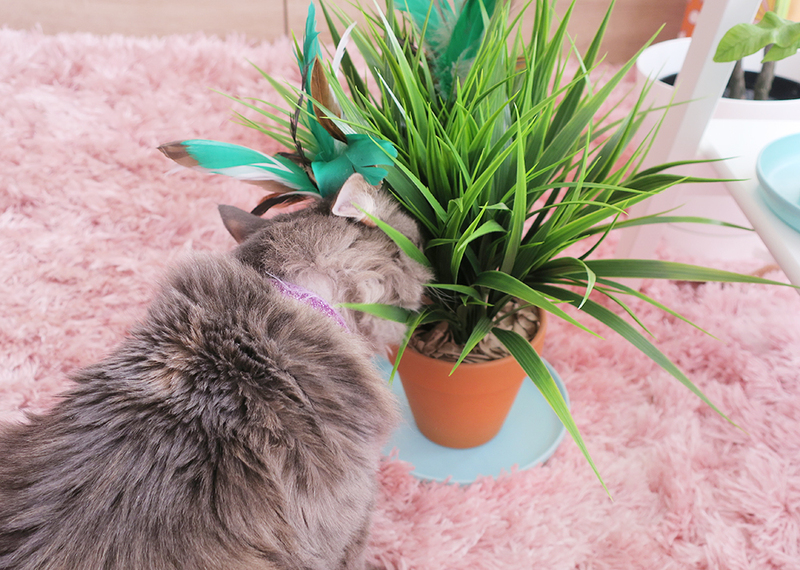 Lately Arrietty has really been enjoying rubbing her face in my houseplants. They're cat safe, so I don't have to worry for her sake, but my plants on the other hand! They're already looking a little the worse for wear because of the lack of sunshine this time of year, and those cat nuzzles are not helping matters any. 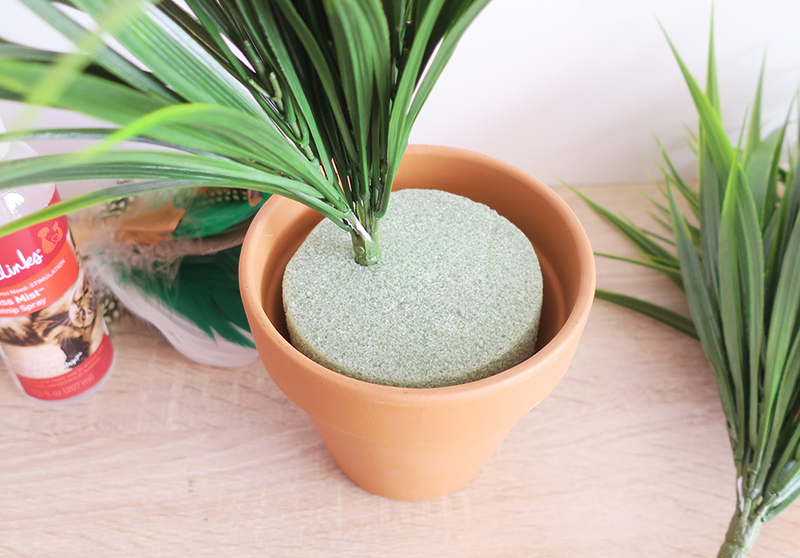 So I decided to make Arrietty her own plant that she can rub her face in as much as she wants! She's already taken a liking to it so I'd say this DIY was a success! When you're shopping for the greenery, make sure you pick something with very substantial leaves that your cat won't be able to ingest. Mine had some small, thin pieces sticking out of it so I plucked them out beforehand. Add some river rocks to the bottom of your pot for weight, and then put the styrofoam on top of it. Insert your plastic greenery. Using a sharp utility knife, cut off the bulk of the stick on the feather toys and then insert the shorter sticks into the styrofoam. I forgot to take pictures of the next step, but to cover up the styrofoam just attach small crumpled pieces of brown kraft paper to the foam with non-toxic glue. 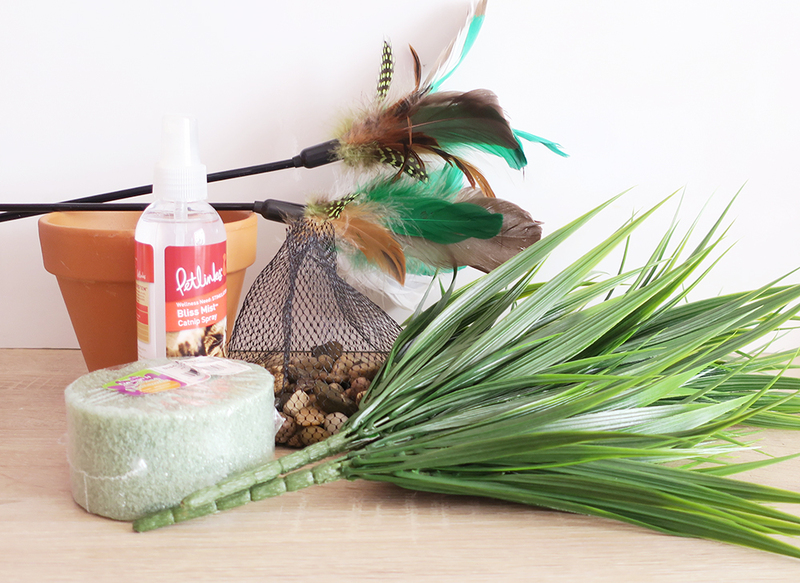 Once the foam is entirely covered in the brown paper (I did two layers of paper to make sure the foam was totally inaccessible) spritz the ends of the leaves with catnip spray to entice your kitty away from your pretty parlor palms and into their own feline garden! I can't say how happy I am with this project! Arrietty is content with her plant and has been staying away from the real plants. I just spray the leaves whenever I think it needs a little catnip refresh.